Chelsea Clinton recently gave birth to her second child, a bouncing baby boy the former first daughter named Aidan Clinton Mezvinsky, according to an announcement made on her official Twitter account Saturday. The news has temporarily pulled Grandma, or, er, presumptive Democratic nominee Hillary Clinton, away from the campaign trail despite a contentious general election battle with presumptive Republican nominee Donald Trump heating up. Many are eager for a glimpse of the Clinton brood's newest member, but will Clinton's grandson join her on the campaign trail? By the time polls open on Nov. 8, Aidan will be a little more than a week shy of five months old, but that gives the tiny tot plenty of time to get in a bit of campaigning for his grandma, right? I mean, kissing babies on the campaign trail is an American political tradition! And Aidan has already had lots of practice from inside the womb, thanks to how often Chelsea stumped for her mother while pregnant with him. Like it or not, however, Aidan is not likely to join his grandma in a final blitz for votes around the country, at least not in a public capacity. Although Clinton has often referenced her granddaughter (Chelsea's first child, Charlotte) in speeches during the Democratic presidential primary — she even jokingly attempted to set her up on a date with an adorable toddler at a rally in Fresno earlier this month — the Clintons have kept the 21-month-old away from the crowds and cameras of the campaign trail in an effort to protect the child's privacy, and it's likely they'll do the same for Aidan. And it makes sense to keep the newborn as far from the campaign trail as possible. Aside from the obvious fact that Aidan has few marketable skills at this point — his next 30 days will undoubtedly be filled with feedings, diaper changes, naps, and spit up — Clinton risks being accused of using her grandchildren as political props if she parades them out at rallies. One of the biggest roles Charlotte has played in her grandma's campaign came in September when Clinton evoked her new role as a grandparent in a television ad. "When I look at my new granddaughter, I think to myself, 'We are going to do everything we can to make sure she has opportunities in life. But what about all the kids?'" Clinton says in the ad over a picture of her and former President Bill Clinton holding newborn Charlotte. "You should not have to be the grandchild of a former president to know that you can make it in America." 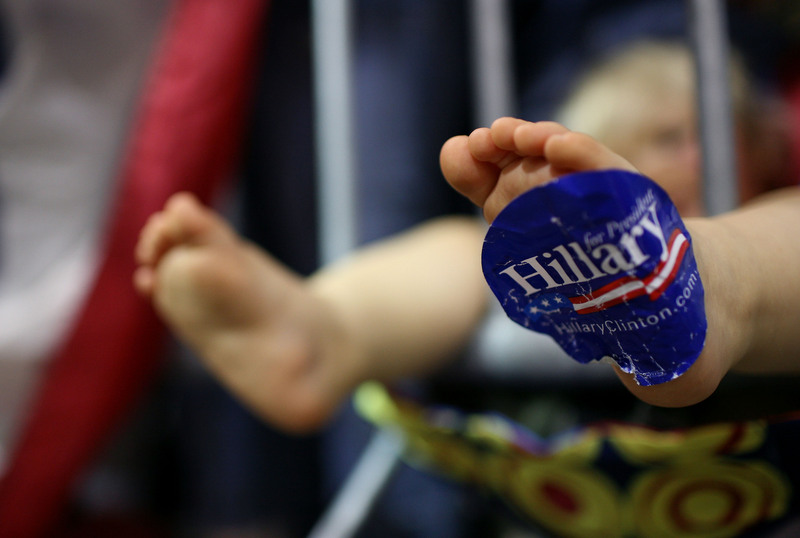 Aidan might not be able to stump for grandma Clinton, because he won't even master holding up his own head for three more months, but we're sure to hear a few tidbits about him at rallies between now and November as Clinton settles for hugging other cute babies along the campaign trail.